High density mobile storage systems can be supplied in a wide range of configurations to suit many industries and storage requirements. 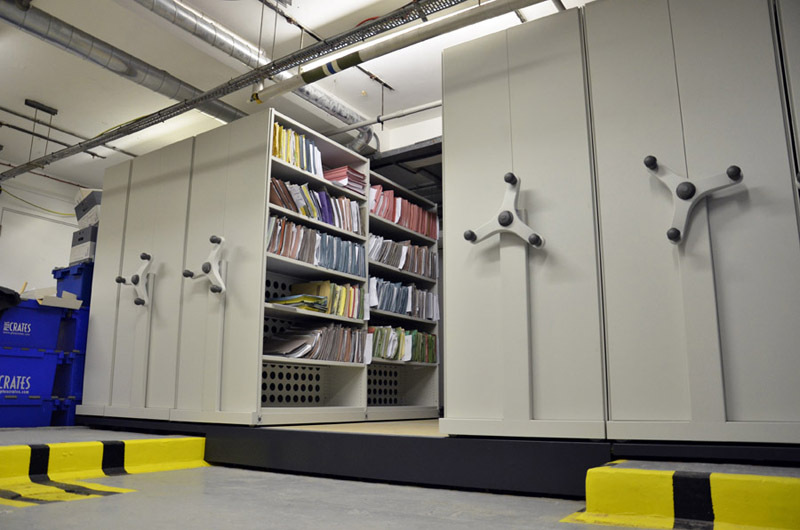 In much the same way as static shelving must be designed correctly to ensure an accurate fit and to provide maximum capacity, mobile systems must be configured to suit both the items being stored and the storage environment. The first steps in designing a roller shelving system entail finding out what floor area is available and what type of items need to fit on the shelves. 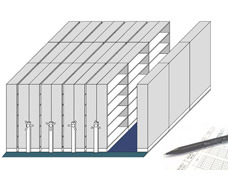 Knowing the area available for storage along with the typical size and weight of the items will dictate how many shelving units can theoretically be installed. 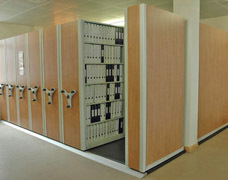 In both cases careful attention has to be paid to the size of the items that need to be stored as this impacts the key factors of shelf width and shelf depth - a good design will ensure that stock profiles are matched closely to the correct shelving components to keep wasted space to an absolute minimum. 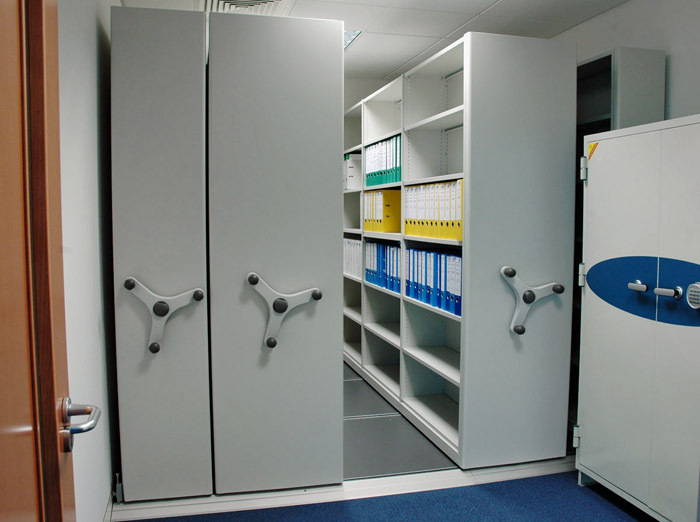 Storage of documents, files and folders can be accommodated in a mobile office shelving based system, many of our office installations us the 'System R' solution, this provides adjustable shelf levels capable of holding up to 80kg (UDL). An important feature of this mobile system is the fact that the track is housed within a raised floor that does not require floor fixing - making it the perfect option for use in rented offices. 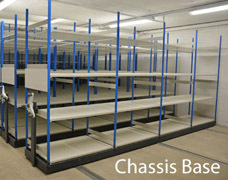 When there is a need to store heavier or bulkier items such as stock or large archive boxes then a more industrial solution is required.The Chassis base (shown below right) is more suited to heavier duty applications such as mobile stockroom racking. 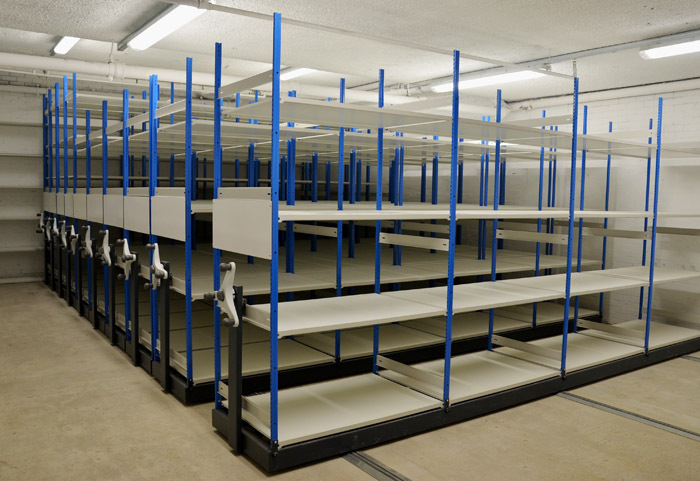 Our E-Z-RECT Trimline and Type 1 shelving systems can be mounted to the chassis base to create the perfect mobile stockroom racking system - benefiting from the same adjustability, strength and slim profile of our static shelves. 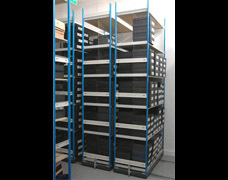 For heavy duty warehouse applications our longspan racking can also be mounted onto chassis bases, this works very well for storing large quantities of bulky items - popular with museums and auction houses. Another consideration is how many people need to access the storage unit and how often. 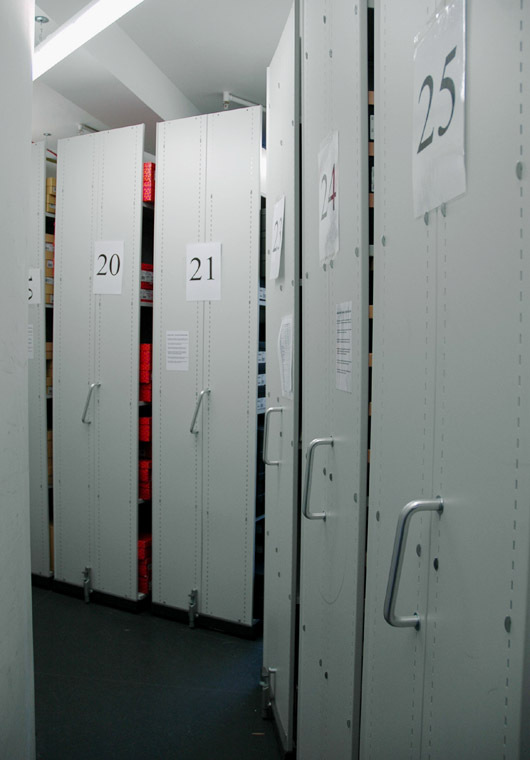 If more than one person needs to retrieve files or stock at the same time then more empty aisle space needs to be factored into the design, reducing the overall capacity of the storage system but improving everyday workflow. For instances when there is an uneven floor or where obstructions cannot be moved, a special raised mobile floor can be supplied. 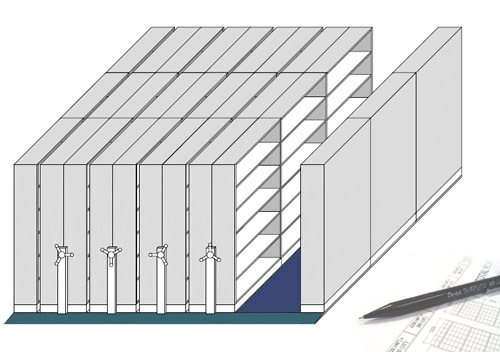 The photo (above left) shows a solution that combats this problem by building across 2 concrete plinths in a 'viaduct' style to achieve a perfectly level surface suitable for mobile shelving. 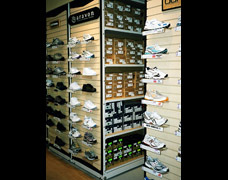 High density roller shelving systems can can provide efficient storage in even the most awkward of spaces, in fact mobiles are commonly installed into small corners to create practical storage in previously an under-utilised areas. There are a number of handle options to help you to move each shelving bay but the most popular are rotating hand wheels, these lockable handles turn a chain and gear system that make the bays glide effortlessly simply by a turn of a handle. 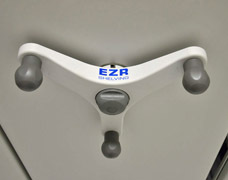 For those on a tight budget, standard pull handles can be specified. 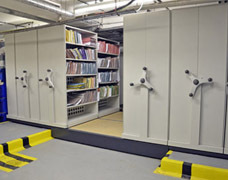 For those wanting something more secure and a bit more '21st century' then computer controlled electric drive units create the ultimate mobile shelving system. 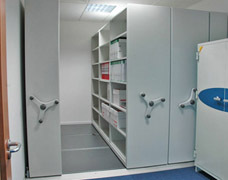 Electrically powered shelving is used for large systems when the weight of goods stored is too heavy to move manually or to create a sophisticated and secure office storage area. 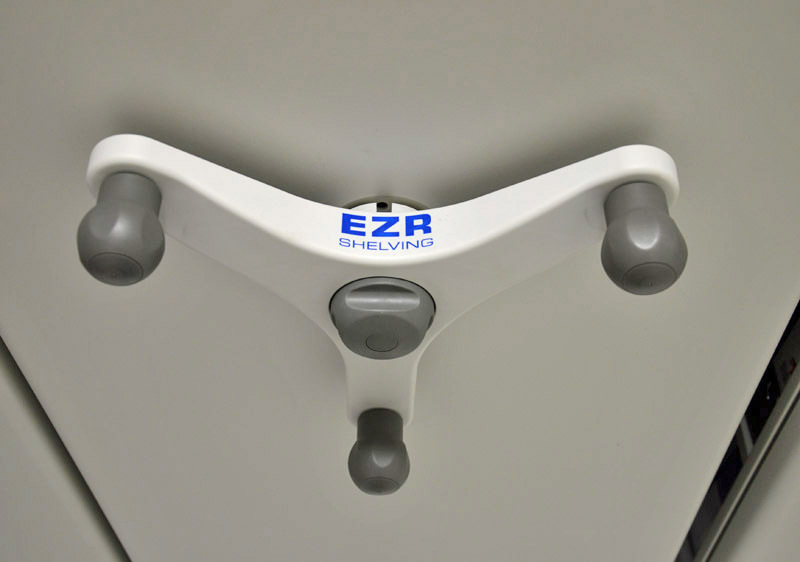 Electric mobile systems also have the benefit of being computer controlled and can be programmed to access the location required at the touch of a button with automatic aisle selection. Computer control introduces many benefits including user security levels to prevent privileged or unauthorised information from being accessed. Fast retrieval is combined with a sophisticated tracking and monitoring system that provides a space efficient solution and complete control over important or sensitive documents. 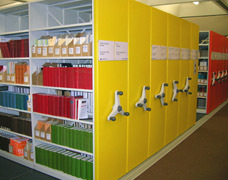 Push-Pull mobile shelving is the most cost effective solution when lighter items are being stored. There is no drive mechanism and the mobile units are simply pulled along the track to open the required aisle. 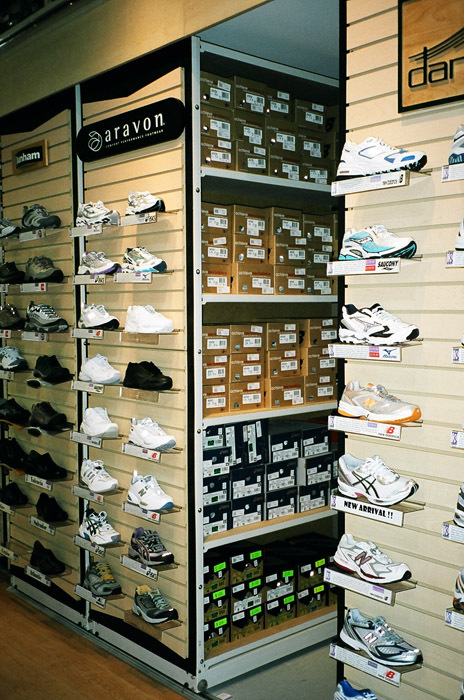 This project shown here (below-right) was for a shoe retailer who did not have a dedicated stockroom for footwear, the mobile shelving contains the stock at the back of the store and is fitted with slatwall providing valuable display space. 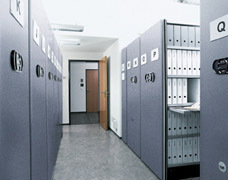 Push-pull is ideal for office systems for filing, and retail stockrooms for shoes and clothing where units are around 2m long. Our mobile systems run on low friction bearings which make units very easy to move and they can be supplied with safety locks to prevent accidental movement. 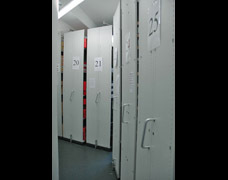 A typical high density mobile system will double storage capacity in a given area and the payback, in many cases, is less than 12 months based on the cost per sq ft of the space saved. 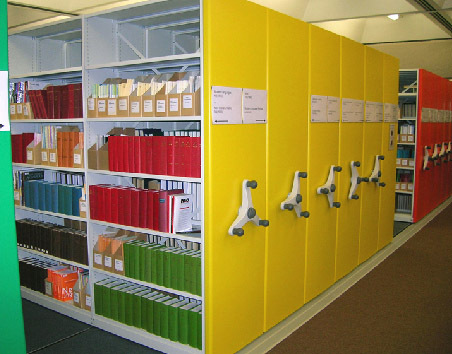 Mobile shelving units can be installed into many different work environments but when used in offices there is usually a requirement to have a more aesthetically pleasing look. In these instances, decorative end panels are a common upgrade to standard mobile units that can transform the utilitarian look of the units into something much more pleasing on the eye. 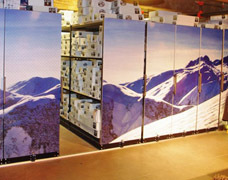 These end panels can be supplied in the same colour as the shelving or in a wide range of finishes to match or co-ordinate with existing decor and/or corporate colours. 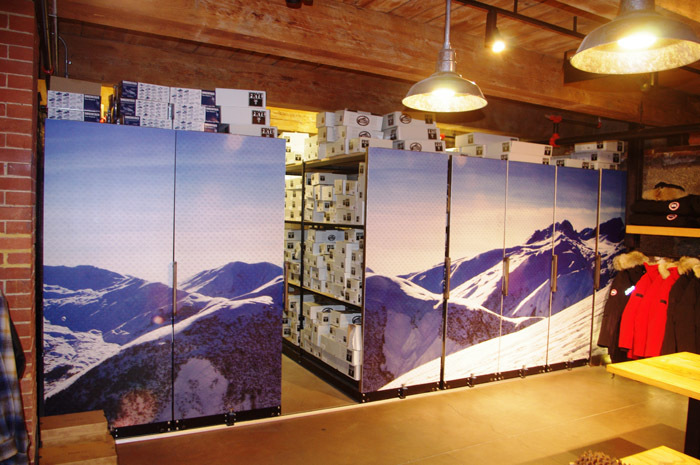 For businesses who want to really make their mobile shelving units stand out, roller racking deco graphics are the ultimate way to express your creativity - adding a striking focal point to enhance the working environment by using corporate graphics or your own photographs. Choose an autumn scene or a bright blue sky to encourage peace and harmony in the office or perhaps something more vibrant like a large photograph of a racing car - virtually anything is possible. Using picture graphics with mobile shelving is a cost effective way of enhancing the workplace for both staff and visitors, and is a great way to disguise what is otherwise a purely functional office shelving system. The photos here show several examples of projects that have made good use of the different decorative panel options. Each one benefiting from much improved storage capacity whilst making a bold statement about their business and brightening the office space to create a dynamic atmosphere. 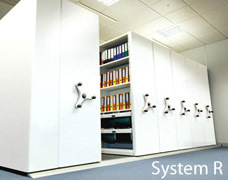 Our design team will provide you with all of the available options to help you choose the mobile storage system that is right for your needs. 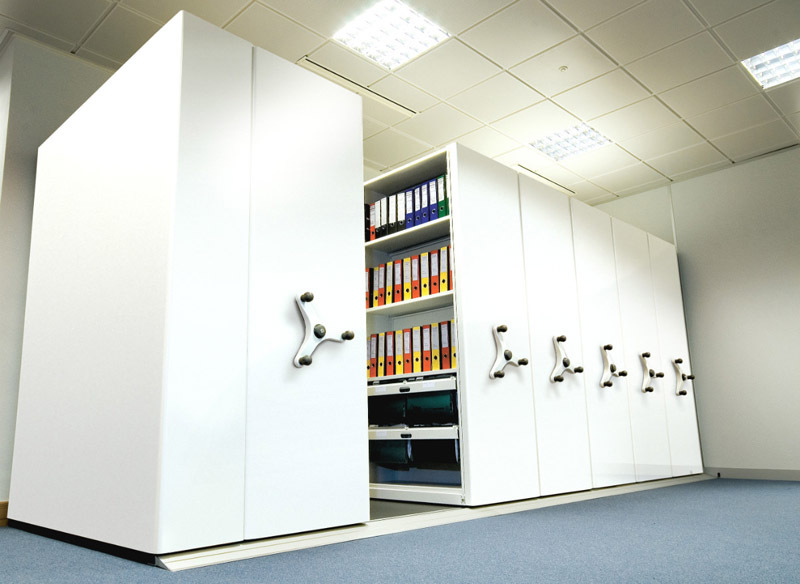 Office mobile shelving units can provide up to 300% more storage space than filing cabinets, or 100% more than static shelving, and when they can look this good they really are a worthwhile investment. 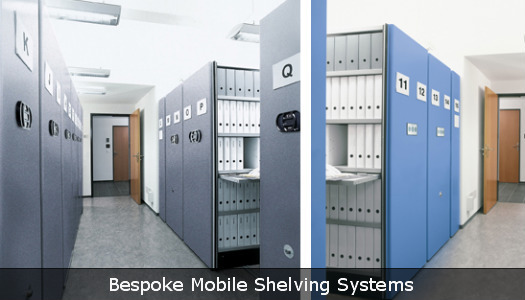 Contact us today to find out how one of our bespoke high density mobile shelving solutions can benefit your business.